Welcome to the Gynaecology CASES webpage. We hope you will find the links and videos educationally useful and relevant. The Pie chart shown below represents the breakdown of gastroenterology referrals received into CASES until January 2017. 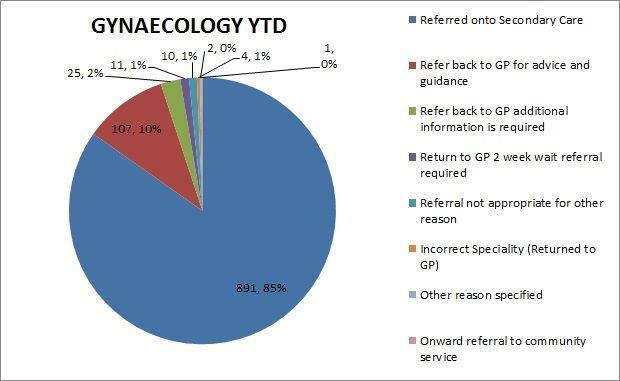 Around 10% of gynaecology referrals sent to CASES are sent back to GPs with advice and guidance on further management. A further 2% of referrals need more information before sending on to secondary care. The peer reviewing GPs for gynaecology are Dr Karen Joshi, Dr Emma Reynolds and Dr Annie Majoka. They work closely with Miss Mary Connor who provides valuable advice and mentorship. 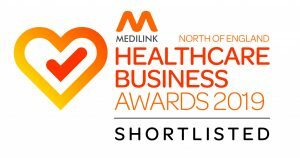 Miss Connor is a consultant gynaecologist at Sheffield Teaching Hospitals NHS foundation trust. The following video on menorrhagia has information on primary care management. It is hoped that colleagues find this and the subsequent web links useful. This second video recorded by Dr Sue Stillwell, Associate Specialist in Gynaecology at STH, offers advice around urogenital atrophy in menopause. This third video, also recorded by Dr Sue Stillwell, Associate Specialist in Gynaecology at STH, offers advice around HRT. 5) The following CASES gynaecology presentation was given by Dr Joshi and Dr Reynolds at the HASL Clinical Council Meeting on 11/05/2017. 6) The following presentation on Adolescent Healthcare was given by Dr Emma Park. 1. Do a smear if due, even if concerns about cervical appearance, as most ‘abnormal ‘cervices will not be Ca and the HPV result/cytology if positive can be useful. 2. PCB – refer only if on-going for 3 or more cycles; if there is an ectropion it can be cryo-cauterised in clinic if symptoms of bleeding troublesome. 3. HMB/AUB – follow the pathways on the Portal, ensure relevant investigations e.g. FBC and scan are done. It’s helpful to include details of contraception/family complete or not. 4. Small <3cm fibroids, unless in the endometrial cavity/submucosal and/or causing fertility concerns, are not usually troublesome or a barrier to Mirena effectiveness and can be managed medically. Refer if >7cm (RCOG guidelines) – no need for CA125 in premenopausal simple cysts. CA125 needed for secondary care if referred as 2WW due to complex nature, so available when seen, on the fast track form. 6. PCOS – most cases can be managed in primary care unless fertility concerns, with hormonal treatment to ensure at least 4 bleeds per year, and advice re weight loss if needed and the link with insulin resistance (guideline soon to be available on the Portal/PCS website). 7. Painful periods – try to treat with COCP for 3 months, if not effective and suspected endometriosis then refer. 8. Prolapse – helpful when referring to mention the options discussed with patients regarding pessaries or surgery and any preference; consider referral to the continence service for patients who haven’t tried PFEs, mild prolapse or other urinary/bowel symptoms or if family not complete. 9. Sterilisation – helpful when referring to mention if Mirena been discussed as an option, equivalent or better effectiveness and added benefit on menstrual loss. 10. Urogenital symptoms – eg vulval soreness/urgency and urge incontinence/recurrent UTI; consider long term Vagifem – need to use for at least 3 months before evaluating effectiveness. Also, use vaginal moisturisers e.g. Replens and lubricants eg Sylk. Dr Joshi qualified from Liverpool University in 1996, and worked in Obstetrics and Gynaecology from 1997-2002, obtaining Membership of the Royal College in 2000. She then moved to General Practice, maintaining an interest in Sexual and Reproductive Health. 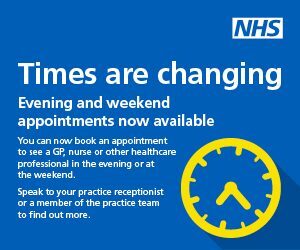 She has worked as a GP Partner at Nethergreen Surgery since 2007, and also does coil and pessary fitting sessions for other local practices in a scheme set up by the CCG Locality. 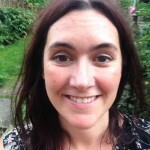 Dr Reynolds is a Sheffield graduate and has worked at Tramways Medical Centre as a salaried GP since 2009. 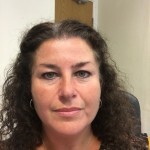 She is a member of West CCG Locality commissioning group, involved in developing the CASES programme, and is currently the CASES Cardiology lead. She has always had an interest in gynaecology and wants to shape services so they are more accessible and sustainable in the future. Dr Reynolds also does out of hours work where she trains Registrars, and teaches communication skills to medical students. Dr Park has a longstanding interest in gynaecology and sexual health stemming from her undergraduate elective in adolescent health in Canada. She qualified from Sheffield in 1997 and completed three years of an obs and gynae rotation before she saw the light and became a GP! She has also worked in family planning, GUM and was a programme director on the Sheffield GPSTS. She is currently a salaried GP and GP trainer at Heeley Green surgery, and member of the RCGP adolescent health clinical interest group. 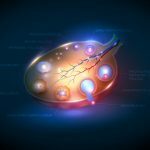 Image (below) on GP resource page is reproduced under license obtained from copyright: 123RF Stock Photo.